Don’t miss the 2015 Bike-to-School Week, September 8-11th. Check with your school to see how they are participating. Through the Bike-to-School Challenge, students who bike to school will be entered to win daily prizes and a grand prize at the end of the week at each participating school. Prizes are generously donated by Provo’s bike shops – Krueg’s, Canyon Bicycles, Racers, Mad Dog, Taylors, Outdoors Unlimited, and the Provo Bicycle Collective. Help your school win the Rad Riders Award! 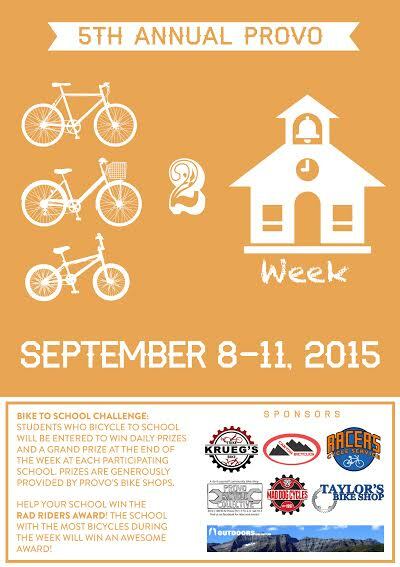 The School with the most bicycles during the week will win an awesome award. This entry was posted in Kids and Family Cycling, Provo Bike-to-School Week by Jamie. Bookmark the permalink.